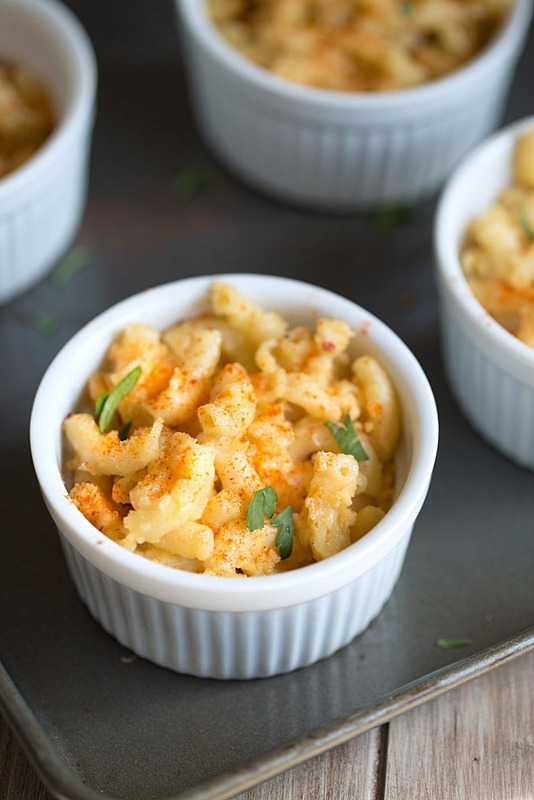 Homemade Mac and Cheese is made with creamy and spicy chipotle gouda cheese. Brown ale boosts the flavors of this comforting recipe. Want to come to a BBQ? This one’s gonna be full of smoked ribs and pulled pork. Homemade mac and cheese made with CHIPOTLE GOUDA! Baked beans. Coleslaw. Cornbread. BEER! There are only two people and one dog living in our house but despite that fact, we always make a ton of food on BBQ Day. Ken says he does all of the dirty work but I beg to differ. BUT, if you call sitting around with your feet propped up while smoking a cigar and checking on the meat every-once-in-a-while a dirty job, well then ok, I guess he does do all of the dirty work. But sarcasm aside, it’s totally a day full of fun, cooking and stuffing our faces! 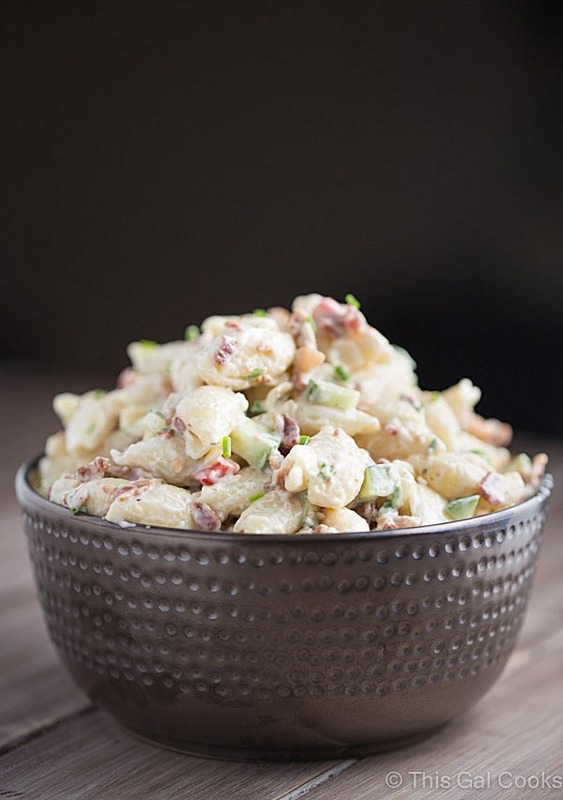 One of my must haves for BBQ day is homemade mac and cheese. I’m all over the place with it meaning I’ve tried 2031561 different types of cheese in my recipes. Not really. I don’t even know if that many types of cheese exist but if there really were that many types of cheese, it would be total awesome sauce because CHEESE! I’ve used pepper jack and parmesan, cheddar and smoked gruyere. Obviously I love variety when it comes to macaroni and cheese. I’ll never be one of those I’m passing down the secret ONLY RECIPE I USE kind of gals. Did you know that I like chipotle peppers? Probably not because I don’t like them. I love them. I always keep a can of chipotle peppers in adobo sauce in my pantry and I almost always have some sort of chipotle cheese in my fridge. On this particular homemade mac and cheese making day, I had a block of Boars Head Chipotle Gouda cheese in my fridge. BOOM. It’s going in my mac and cheese. There are two other types of cheese in this homemade mac and cheese: sharp cheddar and American. Use a good quality American cheese, not the kind that comes individually wrapped in plastic. To give the mac and cheese a deeper flavor and to prevent cheese stringy-ness, I used a 1/2 cup of Cigar City Maduro brown ale in this recipe. The beer lends a significant flavor enhancement to this recipe. If you’re not into beer, I’d suggest trying out a different recipe, such as this smoky chipotle mac and cheese. Cook the pasta. Bring a large pot of water to a boil over high heat. Add the pasta and cook until tender, about 9-12 minutes. **Reserve ½ cup of the pasta water before draining. Prepare the cheese sauce. In a large pot, melt the butter over medium heat. Once milted, whisk in the flour and then add the evaporated milk. Mix well and simmer on medium low heat until thickened, stirring often. Tear the American cheese into pieces and add to the pot. Stir until melted. Add the parmesan cheese and shredded chipotle gouda and cheddar cheeses and stir until melted and smooth. Stir in the pasta water and the beer and mix well. Season with salt and ground pepper to taste. Add the pasta to the cheese sauce by pouring the drained pasta into the pot with the sauce. Mix well. Pour the mixture into a 2 quart baking dish*. Bake at 350 for 20 minutes. After baking, sprinkle with smoked paprika and fresh chopped cilantro, if desired. Be sure to reserve the pasta water before draining as you will need it for the cheese sauce. 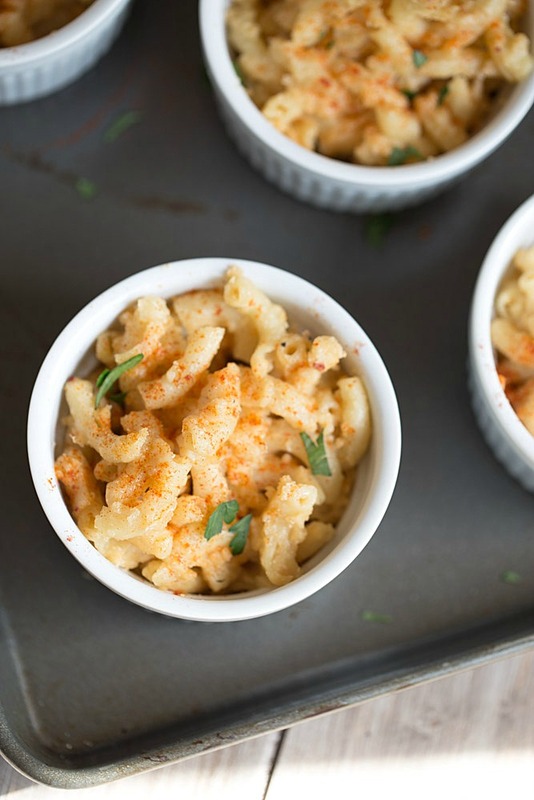 *optional baking dishes for individual portions - you can put the mac and cheese into ¾ cup sized ramekins, place the ramekins on a baking sheet and bake at 350 for 10 minutes. Then top with smoked paprika and fresh chopped cilantro. Serving sizes are approximate and will depend on what you consider a serving of mac and cheese. It's mac and cheese and full of cheese and butter so no calorie counts on this one. I want to come! I totally need this right now. Yummy combination of flavors! 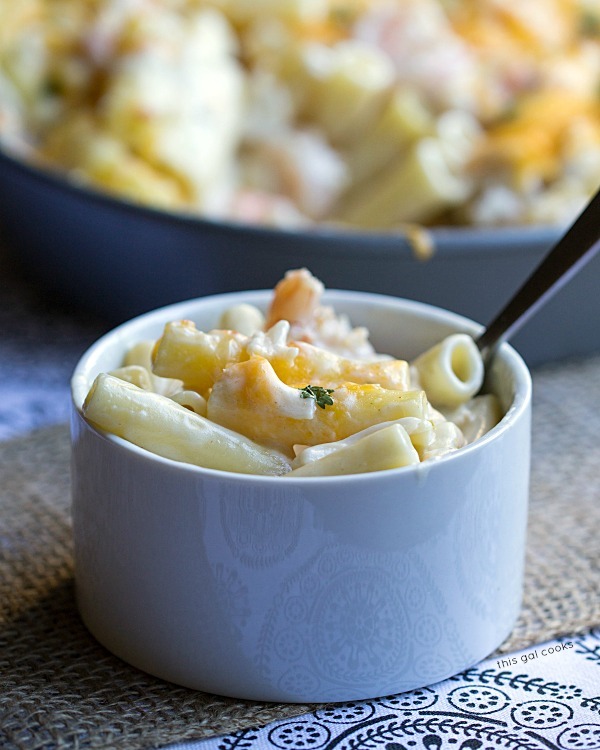 I love your thoughts on what cheeses to use in your mac and cheese. The cheeses are key to success! And this hint of heat is sooo fantastic. This mac ‘n cheese looks perfect! I love the individual portions, so delish! This sounds delicious, is the chipotle Gouda super spicy? Thank you! I don’t think it’s very spicy but I’m a fan of the spicy food and some things that people find spicy, I don’t find spicy. Overall, the mac and cheese isn’t super spicy because of the other cheeses used in it in addition to the chipotle gouda. Hope this helps! Well come on over! We surely will have enough to share. ;) I often forget about the meat and want to eat ALL of the mac and cheese! AH! Mac and Cheese is my favorite! I try not to indulge very often but it’s SOO good. Thanks for sharing this awesome recipe! You’re welcome, Julianne! I try not to either but every time I make it, I always end up eating loads of it. LOVE! MmmmK. You want to stop this nonsense right now?? Tell me you didn’t think of me while making this. I dare you. It has my NAME written all over it and I am dying over here – looks so good! Maybe Ken will fall asleep while his feet are propped up and I will sneak in and eat allllll of it. ;) Pinned! Hahaha, you are too funny, Claire! What are you considering as ‘good’ American cheese? I think of the processed cheese slices or Velveeta. The American cheese you would get from a Deli, such as Boars Head brand. The deli would slice it for you (sometimes you can get it pre-sliced, too). You could also use the Deli Delux Slices. I don’t use Velveeta or anything like Velveeta cheese in this recipe. Oh my word! This looks amazing! Wow! I love every single ingredient in this mac and cheese!!! Chipotles are truly a staple, although my kiddos can’t handle the heat. Too bad for them, that more mac and cheese for me! Haha, that’s what I always say – don’t like it? More for me! We are big fans of spicy foods and always keep chipotle peppers on hand too :) Love the heat in this mac & cheese, it looks incredible!